The Secret Life of Pets has to be one of my favourite films this year. In fact, it’s probably one of the most enjoyable wagging tales of four-legged beasts minus all the bad puns. This is New York, New York and everything we love about it is highlighted in its opening scenes – the bike rides, Central Park, the sunset from the balcony and of course all from the ground perspective of rescue dog, Max (voiced by Louis C.K) who couldn’t be happier with a world that revolves around him and his owner Katie (Ellie Kemper). But one day things change. Katie brings home a massive mountain of doggy by the name of Duke (Eric Stonestreet) who takes over not just Max’s bed but his blanky too. War breaks out as they fight over who gets to be alpha male and before long the two sparring canines find themselves caught up in the underbelly of Manhattan’s independents – i.e. those critters who refuse to be domesticated. Lead by small but fierce bunny (Kevin Hart) and his team (including an alligator, numerous stray cats, a poor tattooed pig and an assortment of other creatures) it looks like these dogs don’t have much chance of landing on their feet – especially as they’re not cats. Fortunately, Max has a beloved in the form of a wee fluffy Pomeranian. Gidget (Jenny Slate) has a heart that pounds for her man-dog and soon rustles up the neighbours to go find him. 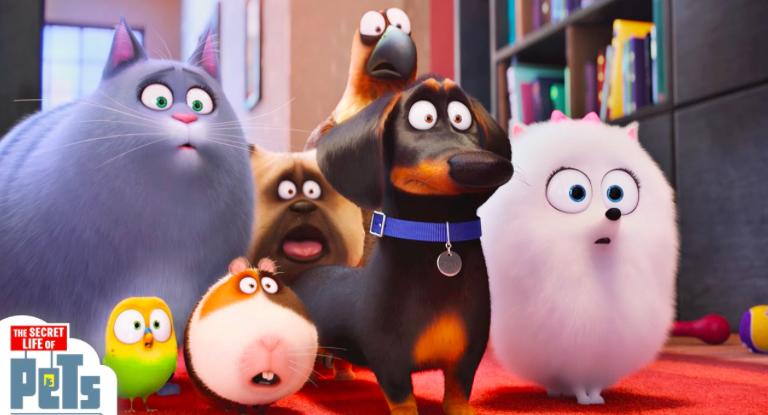 These include fat cat Chloe (Lake Bell) who is an out-and-out Pusheen copy; a less than obliging hawk (Albert Brooks) and a semi-retired Basset hound (Dana Carvey) to come to the rescue. Its game on as the fur, fish and fowl creatures of the kingdom battle it out for survival. Admittedly, its has a predictable plot line and there are plenty of familiar gags, but the fact it’s so ridiculous is part of the charm. Children will adore the utterly goofy characters and there are plenty of jokes for adults to giggle over too. The chase sequences in particular are straight out of any action movie right down to the climax on the bridge (which if it doesn’t remind you of Die Hard not much else will) and its complete with dance parties, dream sequences (sausages anyone?) and all the necessary ingredients for a gambol with a bunch of winsome furballs. It really is the perfect blend of bright, buzzy and fuzzy.